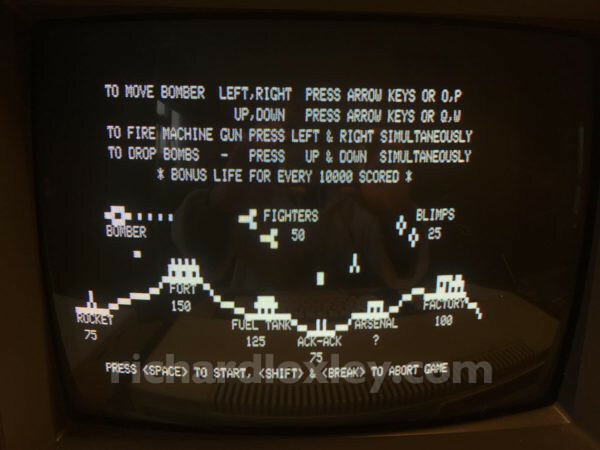 I achieved so much on that computer, learning quite complicated programming, and started dabbling in Z80 machine code (hand coded on paper, of course). Sadly we sold the Genie to help pay for our next computer, an Amstrad CPC 464. At the time I didn’t miss it as the Amstrad allowed me to take my programming adventure to a whole new level. But over time I had great nostalgia for that old Video Genie. 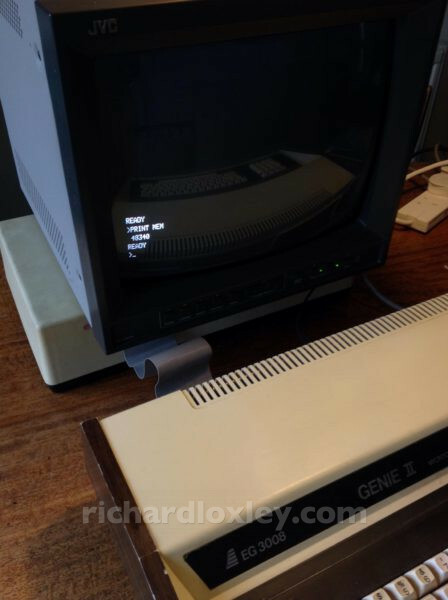 About 15 years ago I managed to pick up an original Video Genie EG3003 (from memory it was from some kind of radio ham jumble sale type event). The seller said he didn’t know if it worked, and I got it for £3 I think. I’d been after such a combination for so long – I just don’t have the patience for loading software off tape any longer, and I’d been planning on getting an SD card floppy drive emulator for my Amstrad computers, so thought this would be a perfect match for my collection. Here I am unboxing it. It was very well packed. 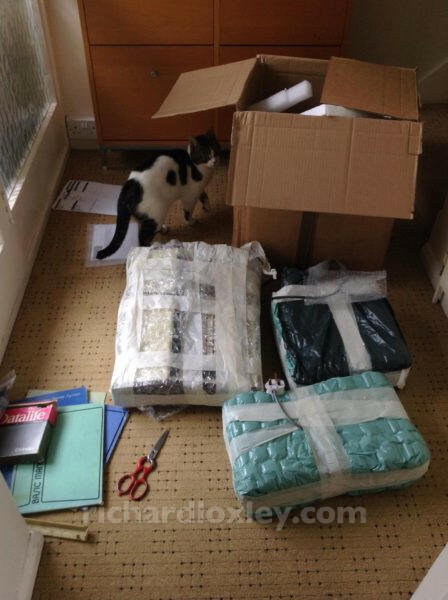 Including loads of cut-up shirts as packing material. I wonder if there’s a story behind those! Jess is eyeing up the box. And unpacked. Those manuals evoke great nostalgia of the model our family used to own. Nice to see a service manual that I’ve not seen before. Lots of interesting-looking disks. Look at the monster heat-sinks on the back of the twin floppy drive (top right)! The TV is struggling to lock onto the timing of the signal (I’ll write about the ‘fake’ analogue video signal these 8-bit computers put out in another post). I’ll try it later with a genuine analogue monitor. I’ll also try the floppy disk interface later once I’ve figured out how it’s supposed to work (I don’t want to break anything). I’ve ordered a frame buffer video conversion board, so hopefully I’ll be able to get that working, converting the video output to a progressive high-resolution, high frame rate VGA display. 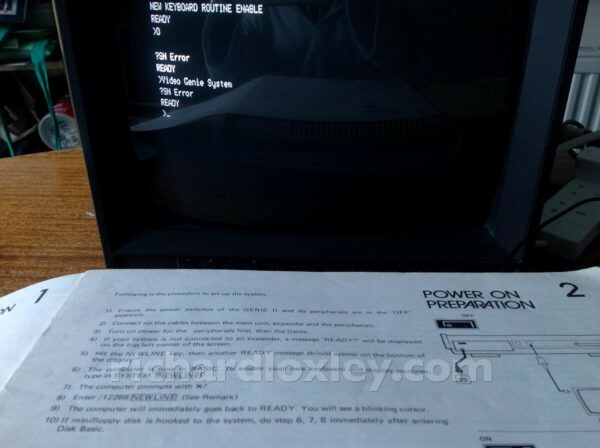 I might also try wiring up a cable to plug the Video Genie into one of the Amstrad high resolution green screen monitors. Just found this in the Genie II manual: there is an extra 1k in the ROM containing some extra routines. 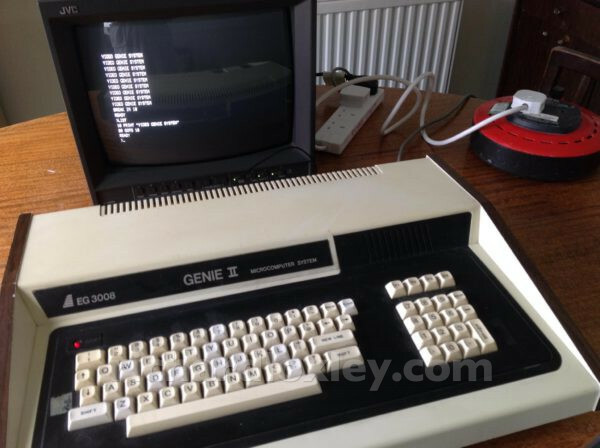 System /12288 loads in a new keyboard handler, which reveals that the Genie II has the lowercase mod installed as standard! Who knew? The manual also suggests using the expansion unit as a monitor stand. My monitor is a bit big for that, but it just about works. In fact I had to do it, as the cables for expansion unit and monitor are so short it was the only way I could have both connected at the same time! 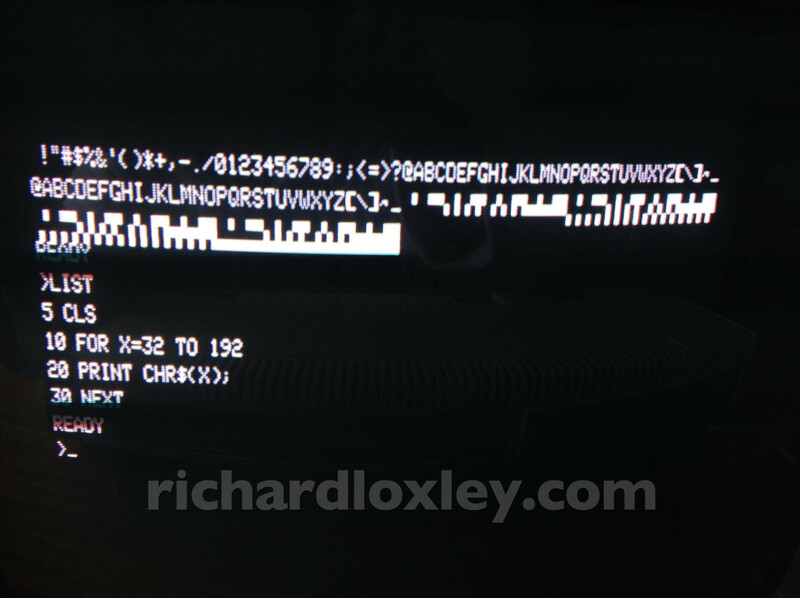 Now how on earth does LDOS work? 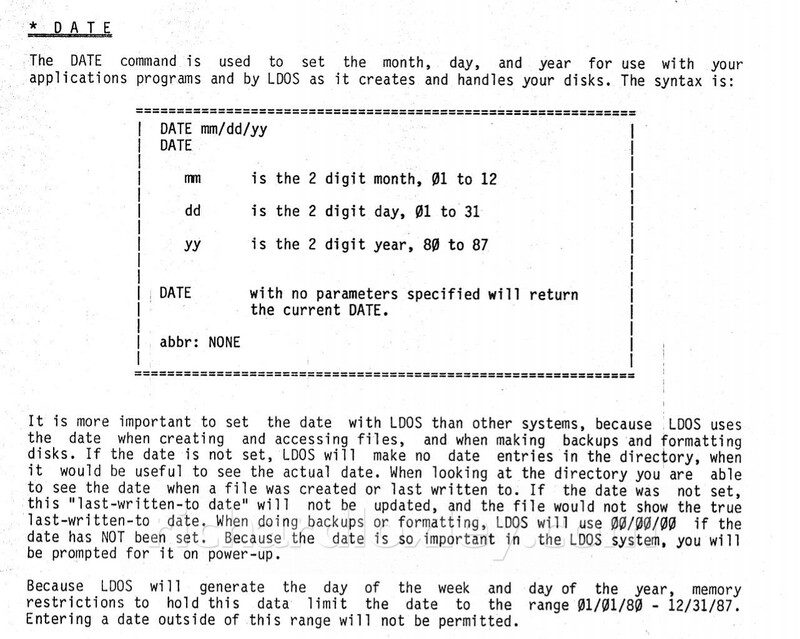 What I thought was an LDOS manual is in fact an LDOS users’ magazine. It asks “Date?” and won’t continue until you enter a date in a format it understands. Eventually by trial and error I found “01-01-80” was accepted. Now I can do a DIR on the system disk, but haven’t found a way of accessing the second drive. Everything I’ve tried gives “illegal drive number”. Off to the manual then. 380 page PDF. Bloody hell! This operating system has a very short design life! I wonder if they stopped at 1987 because 1988 was a leap year? 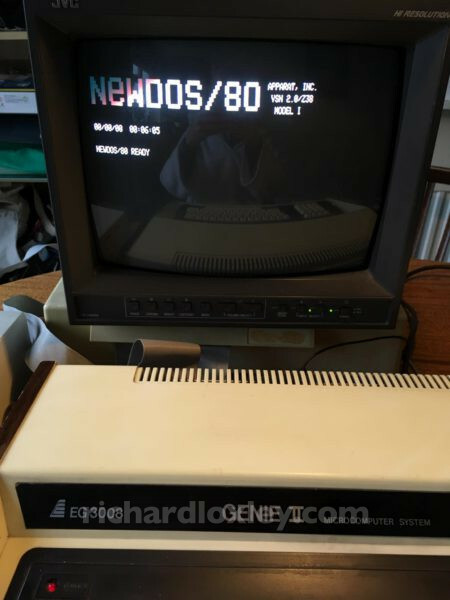 So it seems I also have NewDOS boot disks. 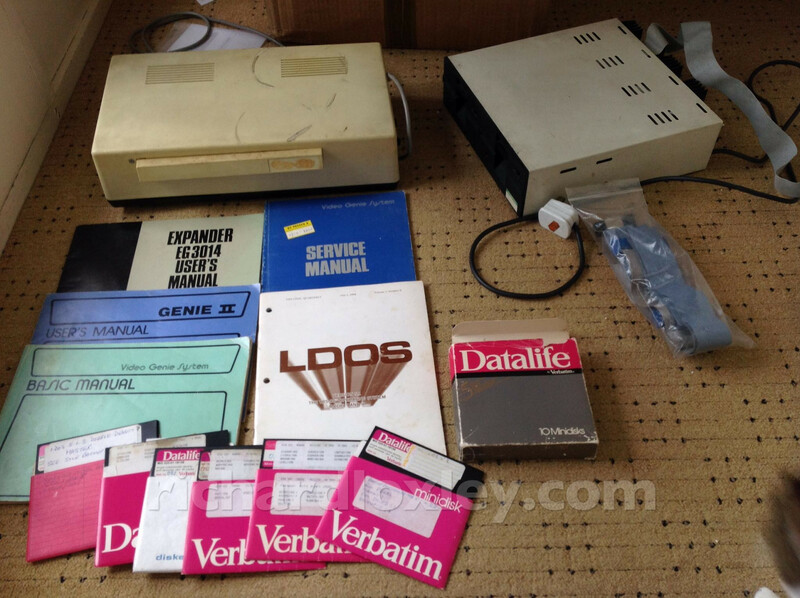 There seem to have been many competing disk systems available. The data disks I was trying to read are also marked NewDOS. But I still can’t read them in the second drive. Neither DOS will access the second drive, and seem to require the boot disk in the first drive at all times, so I can’t do disk swapping. Maybe I should open up the disk drive unit and have a look. 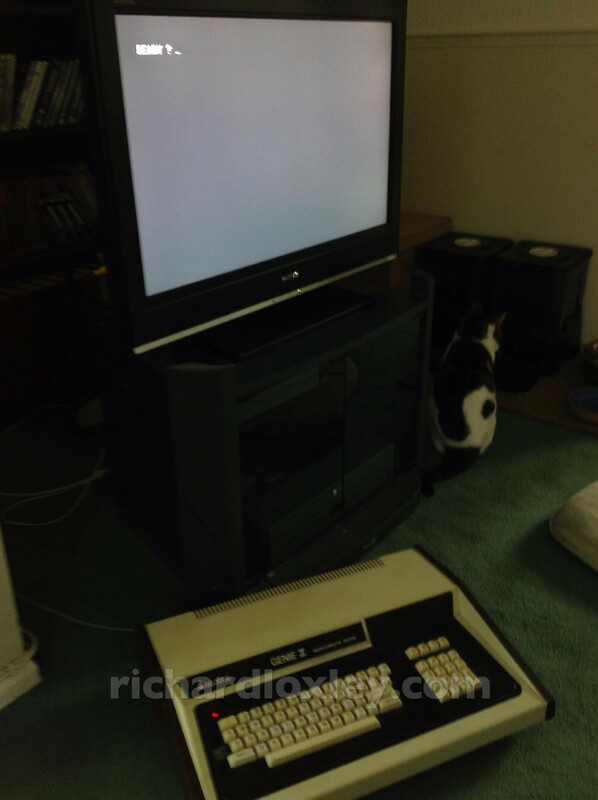 Or I think I have both BBC and Commodore PET disk drives in the loft. I could see if any of those work. 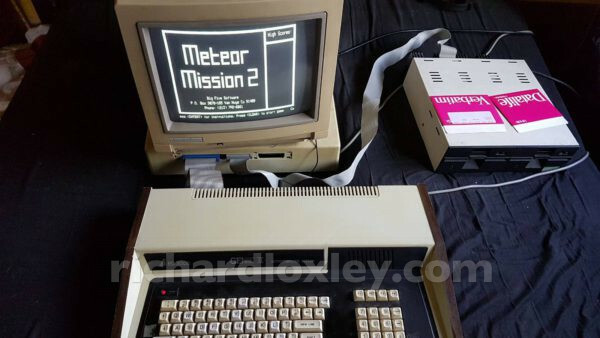 Ultimately I’ll be using an SD card floppy emulator when I get it, so I’m not too bothered so long as the expansion unit with the floppy disk port works. Finally success in loading some software! It turns out this disk was also a boot disk, so I could boot directly from them. But I spoke too soon. 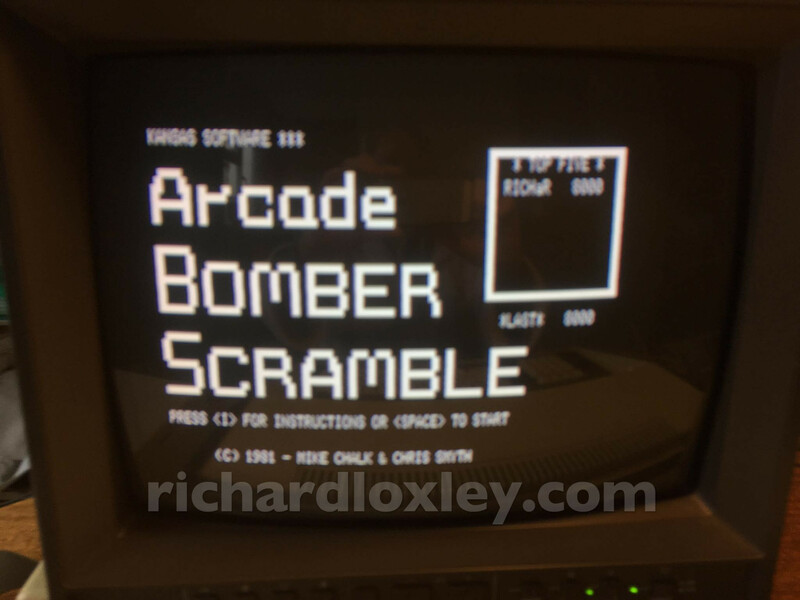 This one was unusual in that it had something on the disk to auto-boot into Scramble. Still can’t access the other files on that disk, and none of the other disks boot up. Also, since I put the LDOS boot disk into the second drive, it won’t boot up in the first drive. I do have a backup LDOS boot disk though. 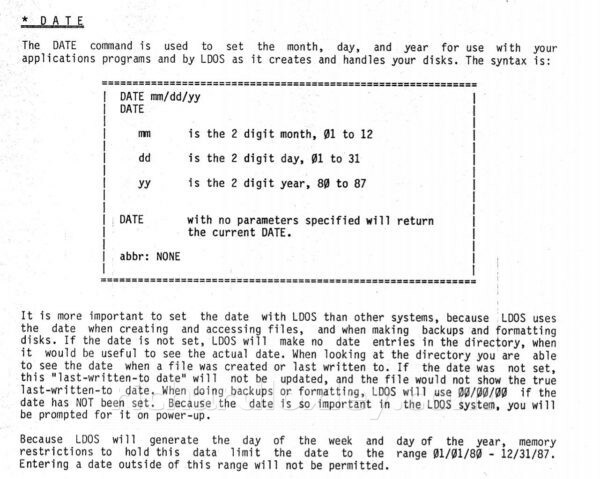 Not sure if I even need LDOS anyway since all the data disks seem to be NewDOS. Still, reasonably successful progress for my first day with my new (old) computer. I’m very pleased with my purchase!